Why - oh why! - can't I leave well enough alone? My very dear friend Matthew was planning a Big Birthday Visit to NYC, and as I had a few hours to kill that morning, and Matty is himself very creative and craftsy, I decided to make him a birthday card. 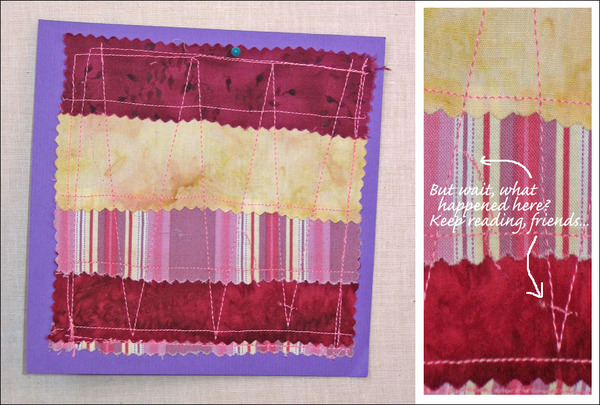 A few of my sewing books have card projects, but most require fusible interfacing, which I didn't have. 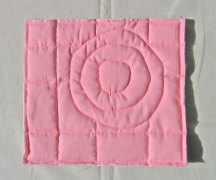 So I opted for the faux-quilted card from Denyse Schmidt Quilts. And I might add, this project is the very first project in the book, so it would stand to reason that it's also the simplest project. Right? Right. 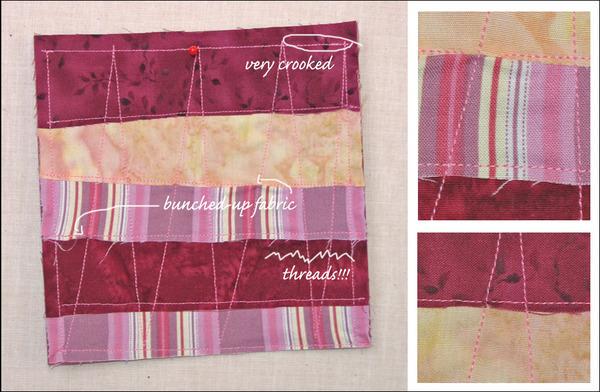 I did have great fun picking out my fabric strips and color combination. Then it came time to actually sew the strips onto the card, which for me was not so easy as it sounds, because the fabric kept shifting around on the cardstock. All my practice making straight lines, and here my lovely present was coming out all crooked! Then, when I "quilted" the project, in some places my presser foot lifted the raw edges of the fabric and sewed them back onto themselves, making a bunchy, messy place. On top of that, though some may consider it "part of the charm," it turns out I am not so crazy about having loose fraying threads all over my project. Perhaps this would be a good time to note that I'm a graphic designer. I'm trained to make everything exactly right, and if that means moving things by a tiny fraction of an inch or making a photo 1.288% smaller, that's what I do. I am not accustomed to accepting mistakes in my work. So naturally, I decided to improve upon Denyse Schmidt's instructions. 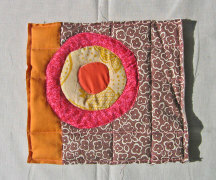 So what if she's been making quilts for decades and I am still struggling to make napkins? I thought maybe if I sewed the fabric strips together first to make a square, then sewed the square to the card, it might be easier to get my hems straight. And to combat my fraying problem, I thought I'd cut the fabric strips with my new pinking shears, which would also give me pretty zigzag edges. Perhaps I could even trim out my square with the pinking shears to a size slightly smaller than the card, so the card could frame my fabric. Pretty! Or... maybe not. Turns out it was no easier to sew my fabric onto the card straight in one piece than it was in several strips. It's just more obvious that it's crooked, because of the way the card "frames" the fabric. Not to mention, fabric cut with pinking shears still frays, except it makes fuzzy edges instead of long loose threads. Definitely not so pretty. I decided that, as long as I was improvising, I'd try some freeform "quilting" lines instead of the diagonal lines in the directions. Of course, I don't know how to do freeform machine embroidery, but when has not knowing how to do something ever stopped me from trying? I figured out how to drop the feed dogs on the machine, no problem. Except that when I tried to sew, surprise!, the card wouldn't move. No feed dogs. I tried to haul it through by hand, but it really didn't want to move. Then I remembered something in my sewing machine manual about lifting the presser foot. So I did. Never lift the presser foot during sewing. This brings nothing but disaster. Specifically, it brings a massive tangle of thread that forced me to open up my whole machine and take out all the insides so I could pick out allllllllllll the pieces of thread that were caught in the innards of the machine. Then I tried to put the machine back together again. It looked like the picture in the diagram, I thought. Except for one problem. The feed dogs would not go back up. I switched the feed-dog-control button from left to right to left again. Nothing. I opened the machine and lifted them by hand. I let go and they fell back down again. I took the machine apart and reassembled it again. Nothing. By this time, I was in tears. I had failed to make the simplest project in Denyse Schmidt's book. I didn't have a card to give to my friend. And now I'd broken my new sewing machine. At last, reaching blindly into the machine with my fingers, I managed to bump something that knocked the feed dogs back into place. Thank goodness! Wild with frustration, I ripped the fabric off the card, tore out as many stitches as I could with my seam ripper (leaving the random bits seen above), and sewed it down to a new card, with much swearing because by now I was too upset to perform even the simplest sewing tasks correctly. I did not give either of these cards to my friend. Sorry, Matt. Do not attempt difficult new techniques until you are much better at using your sewing machine. 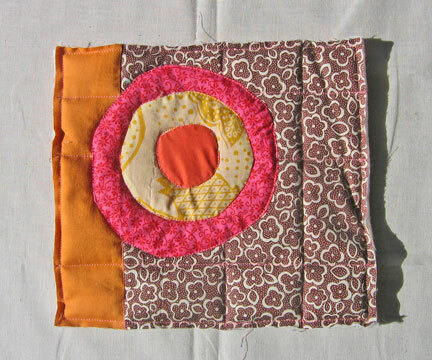 And always practice them first on scrap fabric or paper. Was this not the very first lesson you learned?? Never sew with the presser foot lifted. You do not know how to sew better than Denyse Schmidt. Update: Rachel commented via my Flickr group that, after reading this post, she made her own cards using a glue stick to tack the fabric down before sewing, and they came out great - no slipping. Thanks, Rachel!